Beautiful stone, like a Cycladic figurine. Words have their own story. And kimolia (meaning the chalk) is a word of a black and white era that we loved as kids; the blackboard chalk of our childhood. 60s and our first letters, our most carefree years, will be written in school with it. The medieval sailors will name Kimolos Arzantiera, namely Silver, from this special rock mined from the rocks of Prassa Beach. The limestone with the silver-white color that ends on the beach with the white sand and the bluest waters, one of the most fascinating seascapes in Greece, will become the inspiration for the birth of the unique authentic farm “Kimolia Gi” by Tressos family, eight years ago. This will narrate the Greec of the beautiful words and the Aegean hospitality. The entire family is present. The grandmother recounts secret recipes, the grandfather unfolds stories of the Kimolian life and the grandson, George, conveys this story in the footsteps of today; the old meets the new in full harmony. 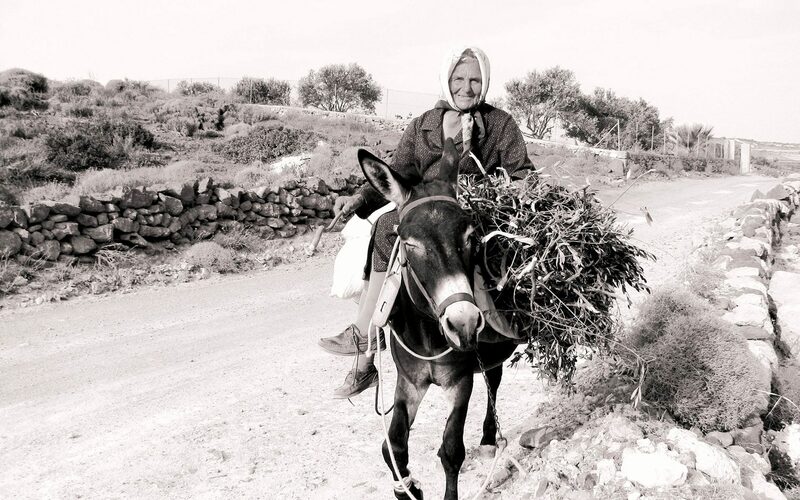 The landlady of the farm with the most typical Kimolian name, “Odigitria”, from the Virgin Mary, the Patron Saint of the island, will ensconce you in absolute hospitality, the landlord Panagiotis will guide you to the real Kimolian life on the farm and the sea and will travel you to the hidden beauties of Kimolos and Polyaigos. There you will find out why the endangered Mediterranean Monk Seal Monachus Monachus opts for the beach of “Kimolia Gi”, Prassa Beach, as her shelter. There you will daydream, you will live the small pleasures of the Aegean, you will taste the eternal Greek summer..
A neat cottage by the sea. The perfect getaway for friends. You’re on the island, you have returned from the beach, you go out on the terrace of your room with a refreshing drink and enjoy the book that tours you in the history of Kimolos. You read there what the large paintings of the rooms, with themes from the magical island, recount. The family trusted their beloved friend and interior designer Lisa Morfonios for the entire decoration. Each little house is a small tour; each theme a painting that immerses you in the island’s history. The old castle, an important monument of Kimolos; its ruins recount the time that passed and left behind architectural masterpieces. The total white of the island’s architecture, the picturesqueness with the huge fragrant basils and the bougainvilleas in the gardens of the beautiful islandish grandmothers. The forest of cactus, slopes full of prickly pears, add the green color missing from the Cyclades. Inspiration is also the rising of the full moon on Prassa Beach that is reflected upon the white sand and composes a silver dream. This unique beauty and the narration of stories in the old grocery of the family a winter evening was the impetus and the inspiration for the interior designer Lisa Morfonios to create “Kimolia Gi”, the retreat of the family. With the same enthusiasm with which she created Aigis Suites, with the same love for authentic hospitality, she will pay special attention to every single detail so as to exude the character and the memories of the island. In defiance of the aura of luxury and refined hospitality that define Aigis in Kea, Lisa transforms every aspect of “Kimolia Gi” into a reference to the farm and the naturalistic experience of Kimolos. In the morning you will wake up from the sound of the waves and have your breakfast on the large terrace of the house; traditional Kimolian breakfast made with love and with the gastronomic grandeur of a traditional cooker of the Aegean, Odigitria. Early at noon you will delve into the making of traditional island delicacies, helping Odigitria in the small kitchen, while Panagiotis will happily introduce you to the farm chores, the cooking in the wood oven and the fishing with his small boat. In the afternoon you will taste the homemade Kimolian wine or the Cycladic cocktails from fruits and vegetables from the family’s garden, infused with raki and ouzo, all inspired by George who, behind his small bar, makes wonders. In the evening the stars, the moonlight and the candles will have become one. Summer dreams smelling jasmine, salt, sea and love begin here, in the six small houses, at the outskirts of the southwestern Aegean, in silver Kimolos, overlooking Polyaigos and the sparkling blue with which we all fall in love, the Aegean Sea. And the island was filled with beauty..
Open windows to let the Mediterranean breeze in, handmade hospitality and local goodies (honey pies, figs, ladenia, curly tomatoes etc. ), sunbathed, spacious terraces to dine on the sea and the sweet harmony of the Greek summer in a house decorated with nostalgic mood. The palette of the words of the Aegean gets enriched. An old photo of a black and white era that we loved as kids comes to life with Cycladic minimalism and the charm of simplicity. The two detached traditional family houses, 50 meters from Prassa Beach, praise the ’60s with decoration inspired by that decade and with furniture with great story, sourced from antique stores, and with family heirlooms dated back to that era. It’s the ’60s in a room on the island. A room that narrates the Greece of Mikis Theodorakis, the islands without hotels, only with friendly homes with electricity two hours in the morning and two hours at night, the cute neighborhoods and the traditional Greek coffee. For a child in the Aegean. To live all day in the sea, to rejoice the simple, unpretentious beauty of the games in the wave, to be all day barefoot with sand stuck on your feet, to sleep in the afternoons and wake up to eat iced watermelon. Images that became the memories of the stories that we loved as kids. Images that will make the memories of our children. Will there ever be a more beautiful feeling than being kid, in summer on a Greek island? The ideal sea retreat for couples. A “syrma” on Zacharias beach. Τo watch you half passing through the water.. The most romantic page of the hospitality of “Kimolia Gi” is dipped in the sand, just by the sea. There where the “white angels” crash, a little home on the sea begins. You have you seen it in your dreams, you have heard of it in the fairy tales, they have called it secret in the Aegean book. The morning light that shines as emerald on the sea, the estrus of the noon, the afternoon sleep of the summer, the scarlet sunsets and the beauty of the moonlight that will find you ready to grab your book from where you left it last night .. The starlight then.. A full moon to take it with you as talisman to brighten your winters. The little home in Zacharias is a “syrma” (wire), a single room, long and narrow, that offers all the comforts. The Kimolians used it as their winter shelter. There they towed their fishing boats and stored their fishing gear, preparing them for the next summer. This traditional architecture has been preserved so that the guest enjoys the authentic experience of the island in an accommodation of exceptional beauty, cultural significance and modern comfort. “Panagia Faneromeni”, the ferry, will dock at the port of Psathi. On the island with the rare gemstones and the unique geological shapes, Tressos family awaits for you. You arrive at Prassa Beach. How many wishes would we make for a sea like this? … you wonder. You wake up sweetly. There where the most beautiful moments are made. Whispering a small word, a sweet purpose: “Summer”. In the white ballad of the Aegean, Kimolos, with the 400 residents, and in the special farmhouse by the sea, “Kimolia Gi”.